The easy way to compare your mixes to commercial ones? Does anything compare to MCompare? Billed as "the ultimate referencing tool for mixing and mastering," MeldaProduction's MCompare plugin is designed to ease the process of comparing your music to a commercial reference track. This enables you to crossfade between your track and another of your choosing with a single click, while selecting a different reference track is said to be easy, too. 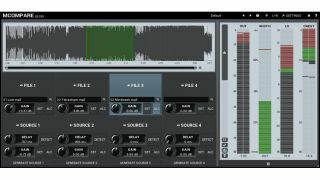 MCompare is also capable of matching the reference track's loudness to that of your own mix, ensuring that you're not confused into thinking that one sounds better than the other simply because it's louder. What's more, you can compare different versions of your track to your reference material - the dry mix and different versions of your mastering chain, for example. Find out more on the MeldaProduction website, where MCompare can be purchased in 32/64-bit VST/AU formats for PC and Mac priced at €29/$36 (this is an introductory price). A demo version is available, too.